Home » Tips and Tricks » Is it safe to drive my car when there are heavy winds? Anytime you are heading out for a drive in inclement weather like wind or rain, it’s a good idea to adjust your driving habits for safe travel. We cover three tips and tricks that can help drivers navigate the streets safely during strong winds below. The larger a vehicle is, the more prone it is to being pushed around in the wind because of its larger surface area. 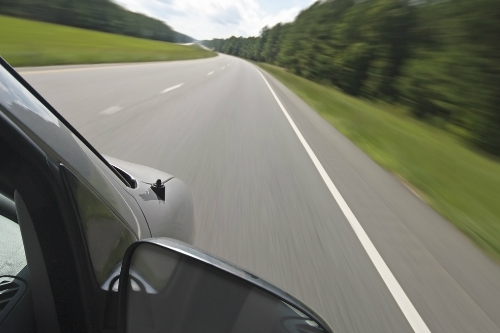 When driving in strong winds, give larger vehicles like semitrucks or tractor trailers a wide berth in case the wind causes them to veer outside of their intended lane. Large open areas or bridges with no protection from the wind on each side are the places you are most likely to run into a problem with side winds. In the city, the houses and/or buildings will block most of the wind before it hits your vehicle, but not so in open spaces. While winds coming from the front or back should only affect your speed, side winds in open areas could push you in and out of your intended lane or in severe cases off of the road. If you do find yourself driving in an open area with side winds, keep both hands on the steering wheel and gently steer into the direction of the wind when you feel yourself blowing off course. The faster your vehicle is moving, the less control you actually have over it. You’re also more likely to overcorrect during strong wind gusts when traveling at faster speeds. We recommend dropping your overall speed during any windy or rainy weather and even more when strong wind gusts are hitting your vehicle. The Autosmart blog is your go-to source of information for automotive tips and tricks, maintenance advice, and local events in the Longview and Texarkana areas. Keep following for up-to-date news on your favorite automotive subjects. This entry was posted on Thursday, January 31st, 2019 at 3:10 pm	and is filed under Tips and Tricks. You can follow any responses to this entry through the RSS 2.0 feed. You can skip to the end and leave a response. Pinging is currently not allowed.